CARACAS (Reuters) – Russian warships will sail into the Caribbean later this year, helping Venezuelan President Hugo Chavez to fend off perceived U.S. aggression and weaken Washington’s influence in its traditional backyard. Evoking Cold War memories, Russia said this week it would send the missile-laden, nuclear-powered cruiser Peter the Great and other hi-tech ships for joint naval exercises with Venezuela scheduled for November. The manoeuvres show a resurgent Russia flexing its military muscle at a time of diplomatic tension with the United States after the Georgia war and over Washington’s plans for a missile defence shield hosted by several former Soviet states. 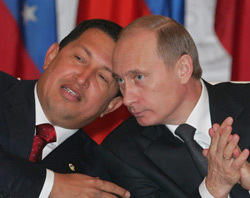 For Chavez, the Russian visit serves notice to the United States that is no longer rules the waves around South America. It also reinforces Venezuela’s diplomatic and domestic policies designed to protect his government against a U.S. attack he says could come at any time. Chavez, the socialist leader of South America’s top oil exporter, likes to antagonize Washington and enthusiastically supports the rise of Russia as a balance to U.S. political and economic dominance, including in Georgia. The man whose military training was in a tank division sees Venezuela as an important player on the side of rising powers such as Russia and China. “Venezuela is a strategic ally of Russia. So let the Russian fleet come. It’s welcome,” Chavez said during his live weekly television show on Sunday. He opposes Washington’s policies on everything from fighting drug trafficking to free trade and promotes Latin American alternatives without U.S. participation, including a defence group. But the ally of Cuba and Iran fears the United States will one day knock him from power even if the superpower denies it supports removing Chavez by non-democratic means. His invitation to Russia to send ships, refuel long-range bombers and temporarily station anti-submarine aircraft in Venezuela is meant to send a message that Washington is not the only military power this side of the Atlantic. The Russian naval visit will be the first such exercise in the Caribbean since the Cold War and it drives home how much influence the United States has over the last few years in a part of the world long considered its backyard. The memory of a generation of Latin American leftists who were crushed by U.S.-backed coups and military leaders has encouraged Chavez to spend part of an oil boom to bolster diplomatic support and renew Venezuela’s aging weapons. He bought state-of-the-art fighter jets and is in talks for Russian submarines, while China has sold Venezuela radar and is helping it put a communications satellite in orbit this year. Chavez sees the relaunch this year of the U.S. Navy’s Fourth Fleet, which will patrol Latin America for the first time in half a century, as an aggressive act. His attitude to Washington soured after a brief coup against him in 2002 was initially welcomed by U.S. officials. Since then he has spent millions of dollars in aid to poor neighbours in the Caribbean and Central America, earning goodwill he hopes will convert into support during important votes at the United Nations and other diplomatic bodies. In Venezuela, Chavez has promoted changes to prepare the army, backed by a large reservist force, for a guerrilla-style war in the case of invasion by a superior force.